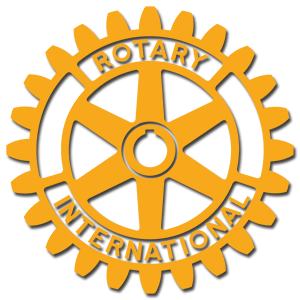 If, as figures on the calendar prove beyond a doubt, the Alton Rotary Club is 50 years old, come March 1, (1971) in what manner shall a history of its experiences be composed? Perhaps, at this state of maturity, it is more revealing to review the first two decades, since the last three are fairly fresh in the minds of present-day members. This familiarity does not necessarily breed contempt, but the events of the '20's and '30's may serve as a background and research for the question of origin. It has the added virtue, for this historia, of presenting opportunity for recollection which only the senior member of the club, Martin Bristow, can dispute with regard to accuracy - and he's too chivalrous to exercise this right. This virtue may be counteracted by the necessity to include first-person references, for which there is regret, but no apology. Browsing through the only records available, those of the last 30 years, one finds accounts of directors' meetings in which civic undertakings were given support from the club. The survey of historic buildings; Promotion of the West Junior High School Stadium; Establishment of the short-lived City Manager Municipal Government; McAdams River Road; The Belt Highway; Obstetrics in the Wood River Club which gave the district, Governor Art Hunter and the Bethalto Club; Campaign and election of Ed Brown and Governor; Football tribute dinners to the Alton teams; Ladies' night for beaming Rotary Anns gay in flowery corsages and alluring perfumery; Great fiscal concern over honoraria for speakers; Records lack readability, as do most minute books. Perhaps most impressive is the record of budgets of $1600 a year in the depression '30's contrasted with the current reckoning for 1970, of $5192 Revenues and $6158 Disbursements; which parallels current methods of financing among families, businesses and governments. Principal problems were those of members delinquent in attendance. Early they learned the folly of trying to be a Lady Bountiful. The river front was an unsightly landscape with squatters' shanties, fish markets, rambling boat docks...this of course before the locks and dam were built. Someone proposed that this be alleviated by dredging sand over the clay banks to improve appearances; someone let a contract; and later the members of the club were billed for $25 each, much to their dismay, because there was no one else to pay the bill. Dollars were hard come by, in those days, and it cured the club of taking on great undertakings for many a year. No collections of funds, however worthy the purpose, were allowed, nor membership based on political occupations-two principles which were later abandoned. When the club reached the adult age of 25 years, the occasion was observed with fitting ceremony, and a list of the names of former members, 184 in number, was compiled. Paraphrasing the Ziegfield Follies' motto "through the portals of Rotary" had marched the humble merchant, the top industrialist, names that built towns. .. Milnor, Lafe, Young, Rodgers, Mathews, Beall, Blaske, Corbett, Duncan, Ferguson, Hayes, Levis, Luer, Manbeck, Muiroy, Olin, Sparks, Watkins, Wessel. All-time tops in programs. . . Paul B. Cousley, the most knowledgeable of Altonians, who vehemently denied ability to make a speech; describing the life of Elijah Lovejoy as a resdent of Hunterstown; and the assassination which divided the citizenry and blighted Alton's opportunity as a river port at a time it was a neck-and-neck rival of St. Louis. Bert Caldwell, dignified banker, who delighted at being called Bert instead of Mister; describing his concept of Rotary as a way of life second only to religion; and bearing enduring friendship for a secretary whose bulletin had given functional account of a winsome miss, from who he had required some mark of identification to cash a check; and who showed him a birthmark just above her attractive left knee; at a time miniskirts were never dreamed of! The war years '41-45, and '50-53, when most every member had a son in the armed forces, some as many as five; Ratchet listed eight Rotarians in the service; and club members all were on committees for the war effort; Ralph Jackson, Frank Rhine and Lafe Young staging blackout drills. Greatest effort in fellowship and cooperation in these recollections was the District Conference in '32 when Carl Hartmann was president; so amiable was he that anybody would do anything for him. It was the first such undertaking of this kind for Alton in years. Four hundred registered; sessions opened in Western Military Academy; reviewed the parade of proud cadets; moved to the Steamer St. Paul the second day for a cruise to the confluences of the Missouri and Illinois...the meeting of three mighty rivers; Luis Machado, handsome son of the President of Cuba was the international representative, could charm the bird out of a tree, and did. The finale was the governor's grand ball in the W.M.A. gymnasium. A second conference came later, when George Wilkins was Governor, but is dim in memory. Schoolman Ray Ready was then president and Wilkins later went on to become State Superintendent of Public Instruction. Now these are the recollections of a membership which began in 1923, and are still cherished as memoirs of an association in 48 years of helpful and congenial fellowship. The president ordered written an account of 50 years of Rotary in Alton, and what it has meant. 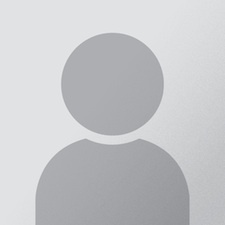 In all this time, officers and members have come and gone, but of them all, the most diligent worker, the most devoted to principle of Service Above Self, and the most honored by his contemporaries, is the modest editor of the Ratchet, Louie Rupp. These may be many words, but such are the little things nice Rotary Clubs are made of. Matured by the variety of experiences encountered in its first half century of Service Above Self . . . with its low charter number, 851 . . . the club fashioned its sixth decade in more conventional channels. 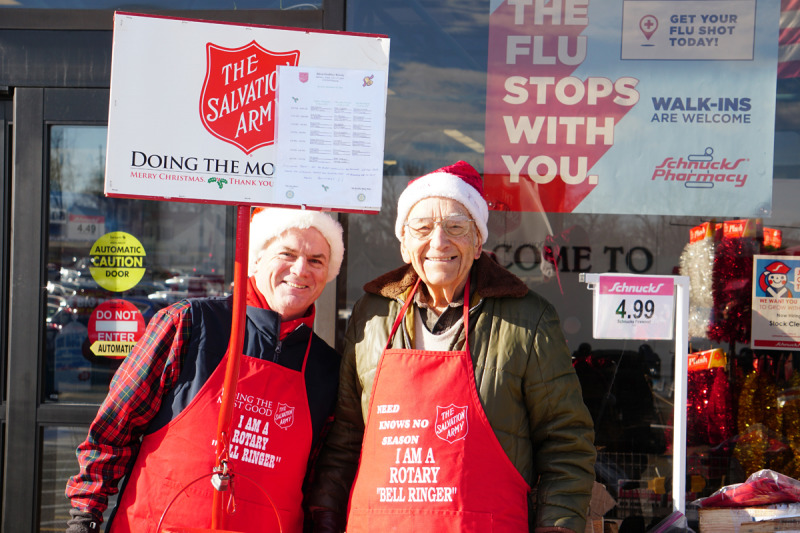 Younger business and professional men became Rotarians, found their occupations more intricate than had been those of their predecessors, and directed their projects in community betterment along practical lines. 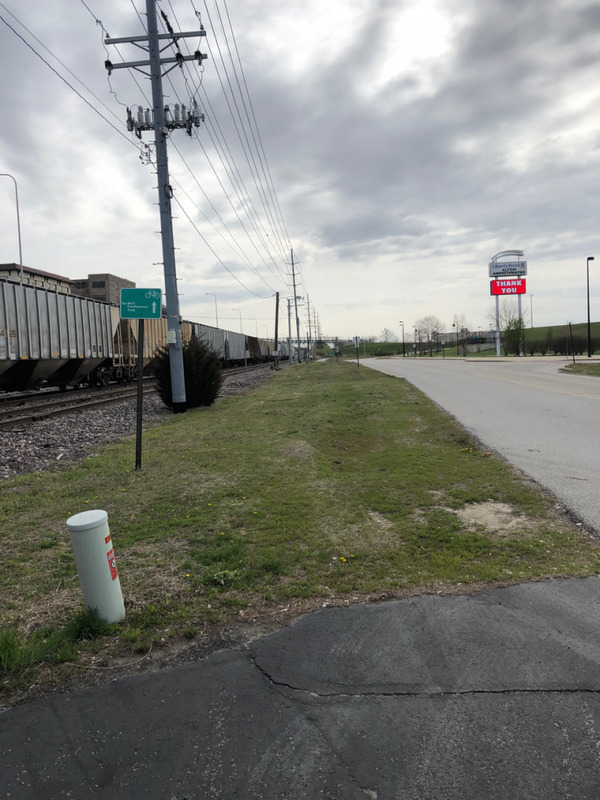 Among other innovations, the Club bowed to the exodus of business and residential locations, moved its meeting place to the Ramada Inn on the Beltline, and changed its name to the Alton/Godfrey Rotary Club. Fountains, spraying fountains, became a major project directed at improving the ecology of the city. The first was installed at State and William Streets, followed in turn by one at Thirteenth and Belle, a third at North State and Belle, and a fourth in UpperAlton (at Washington Square). 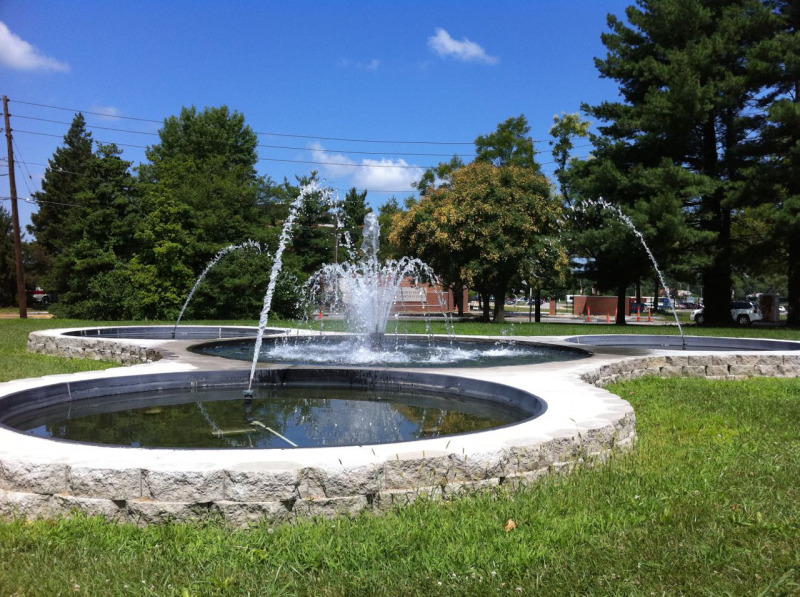 This one was christened the Roger Templin Fountain in honor of an Upper Alton partriarch who had withheld his residence from the march of commercial development into a busy shopping center. One project, a playground at Thirteenth and Piasa, designed for use of underprivileged children, cost $1,500 but failed of permanence as interest in it subsided after its newness wore off. 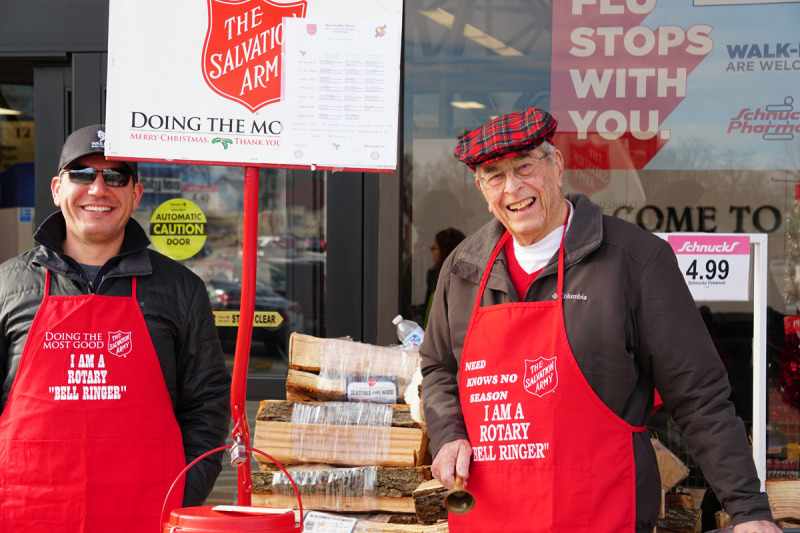 Unique among its achievements was the Club's sustained leadership in bell-ringing and gleaning contributions for the Salvation Army's annual Tree of Lights, ramroded by Andy Jackson who shares his name with an illustrious former President. 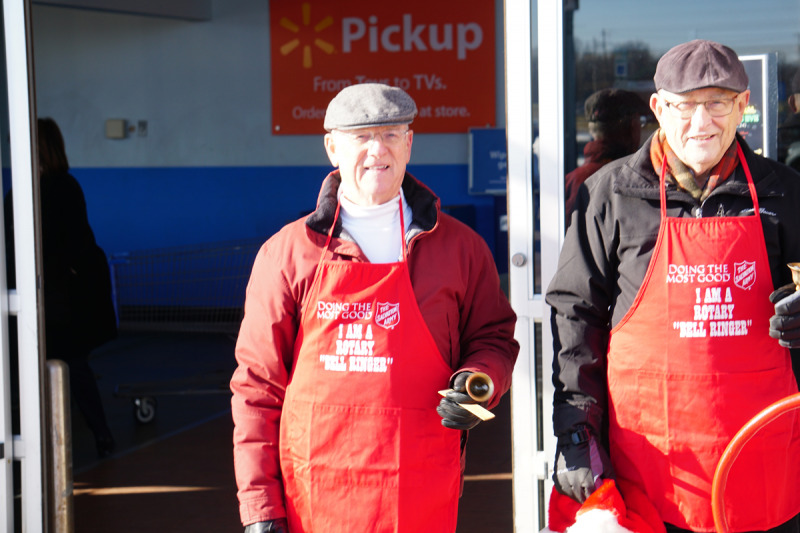 Year after year, the yield of Rotarians to this charitable purpose led those of all other participating agencies. In the area of education and international good will, the Club's sponsorship of sending Exchange Students to foreign countries, intended to serve as ambassadors of American friendship, should rate high in academic appraisal. Seven students . . . none of them from Rotary families. . . were sent to countries ranging from Denmark to the Indian Ocean. During the latter half of the decade, much of the Club's activities have focused on helping in the development of Alton's Gordon Moore Park. In cooperation with Kiwanis and the Junior Service League, it shared in the installation of a playground and the Nan Elliott Rose Garden. These undertakings required physical labor... usually difficult to engender in such causes. .. rather than routine payment of costs. Among the Club's changes in procedure has been the decline of vocal renditions of historic Rotary songs, a traditional feature in the routine of Rotary meetings. This is attributed to the absence of a persuasive piano player, leaving the only area of capable song leading in the hands of Frank Boals, the only member gifted in the field of music, who struggled manfully on occasion for a capella renditions in a waning talent for harmony among the membership. All in all, the Club has enjoyed a constructive decade of Rotary Service to its community as capable and progressive officers have been chosen to direct its undertaking. 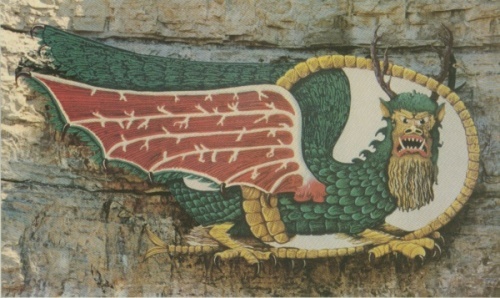 1983 - Restoration of the Piasa Bird. fabricated steel hung on bluff. Donations of labor and materials $35,000. 1985 - Robert Wadlow Statue. Donations of labor and materials $110,000. 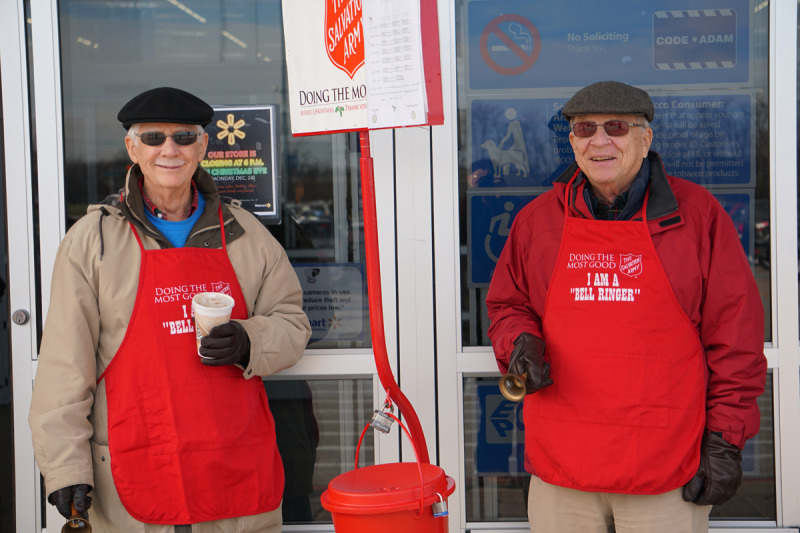 Fund raising was conducted by Rotary and Upper Alton Business Association. Bill Moyer supervised construction. Sheppard, Morgan, and Schwaab company provided the engineering expertise. materials were donated by various local businesses. 1987 - Construction of Rotary Lodge, Boy Scout Camp Warren Levis. Donations of labor and materials $12,800. 1987/88 - Polio Plus - Rotary International project - Immunization for all the children of the world. Three year program. Donations $40,000. 1989 - D.A.R.E. van to support anti-drug program in Alton schools. $8,000. Indian legend has it that centuries before the white man came to what is now southwestern Illinois, a giant bird with antler-like horns, horrible red eyes, a somewhat human face, a body covered with scales, and a long serpent-like tail cruised the skies in search of prey. Just a legend? Maybe. But the image of the bird on the bluff is real enough and has endured for centuries. Explorer Jacques Marquette first sighted the painting In 1673 during his journey down the Mississippi River. In 1983, the club developed a plan to paint the bird on an aluminum sheet and bolt it to the bluff. 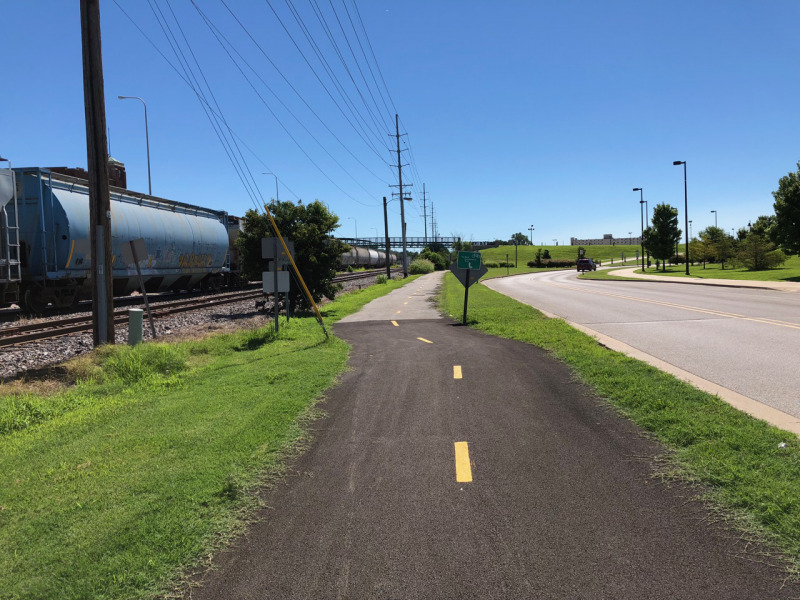 The cost of the project was estimated at $50,000. The giant bird remained on the bluffs until 1992. In 2000, Rotary received a letter from a student at Southwestern High School. As a result of this letter, the Piasa Bird was donated to the Southwestern school district in 2001. 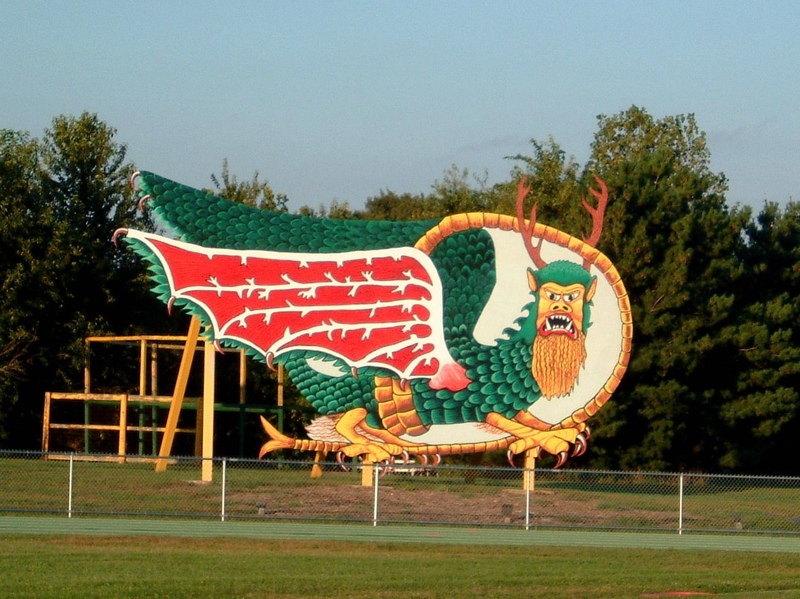 The bird is now a part of the sports complex on the grounds of the high school near Piasa, Illinois. April, 1993 - Rod Elias and Clem Benning lead the effort of the club to raise $8,000 for bullet proof vests for the Alton Police Department. Sixty five officers received vests. In 1995, $251,000 were raised with memorial bricks to help raise money to finance the erection of statues of Abraham Lincoln and Stephen Douglas. Statues are located on the site of the historic debate in 1858 between Abraham Lincoln and Stephen Douglas. 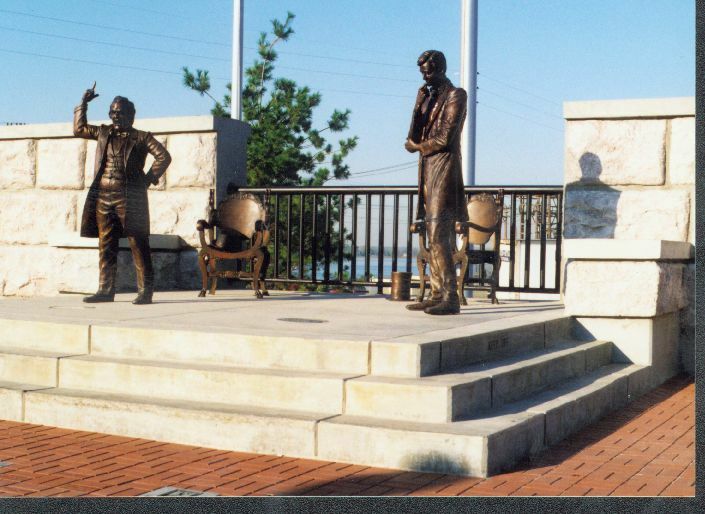 The statues commemorate the 137th anniversary of the historic 1858 Alton debate between the two in their race for the senate. The unveiling followed a 35 minute dedication of the statues. Sculptor Jerry McKenna of Boerne, Texas, called them his best works. 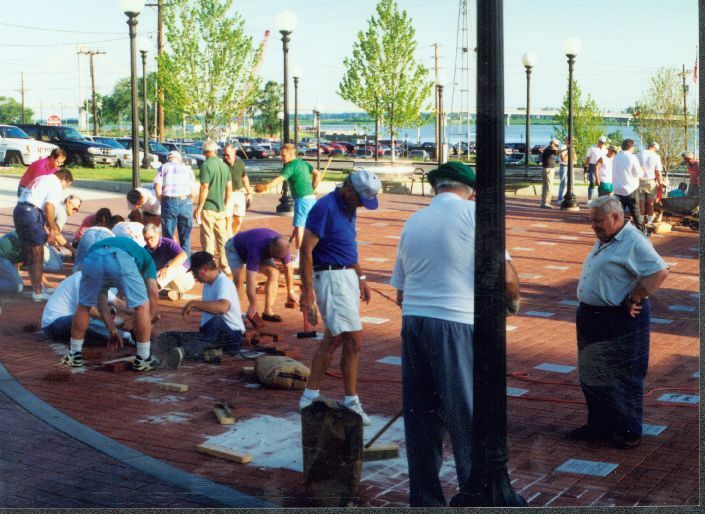 The sculptures were part of a $245,000 effort by the Rotary to sell bricks and granite blocks to pave the square and commission the statues. McKenna, who received $105,000 for his work, was chosen from among seven well-known sculptors. 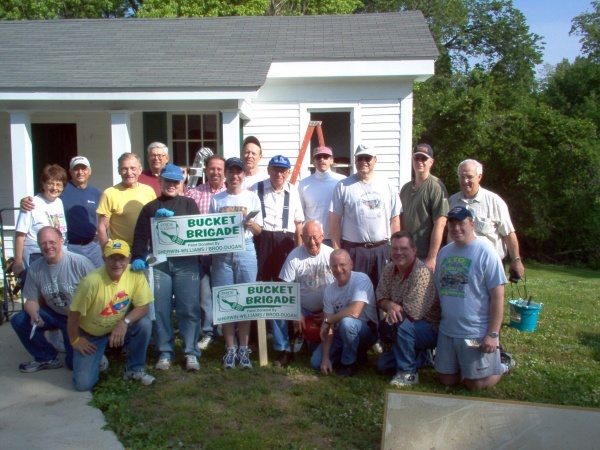 The Bucket Brigade was started in 1988 by Dale Neudecker as president of Pride, Inc. Volunteer painters from church groups, civic groups, organizations, schools, and families were responsive to the call to service. The paint was provided by Sherwin Williams and donations from other local businesses. The Telegraph was a cosponsor contributing many ads and stories. 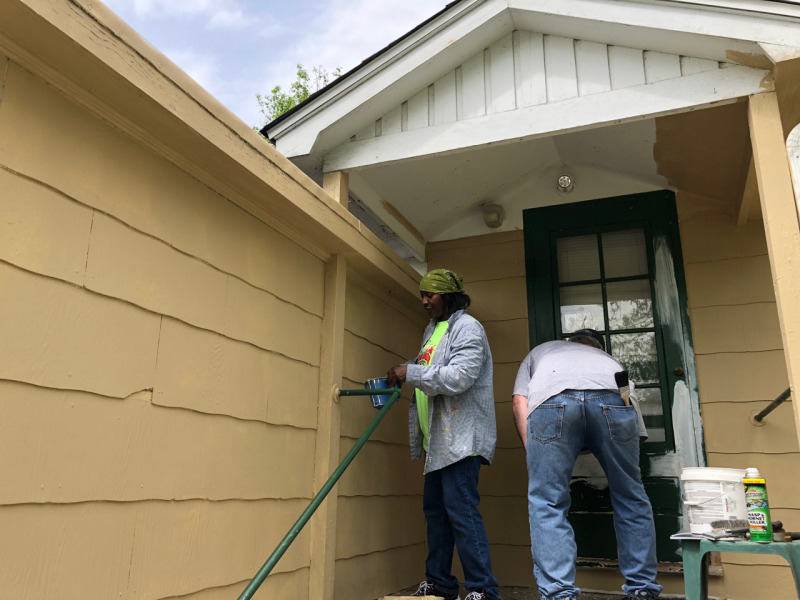 The Bucket Brigade has painted thousands of homes. 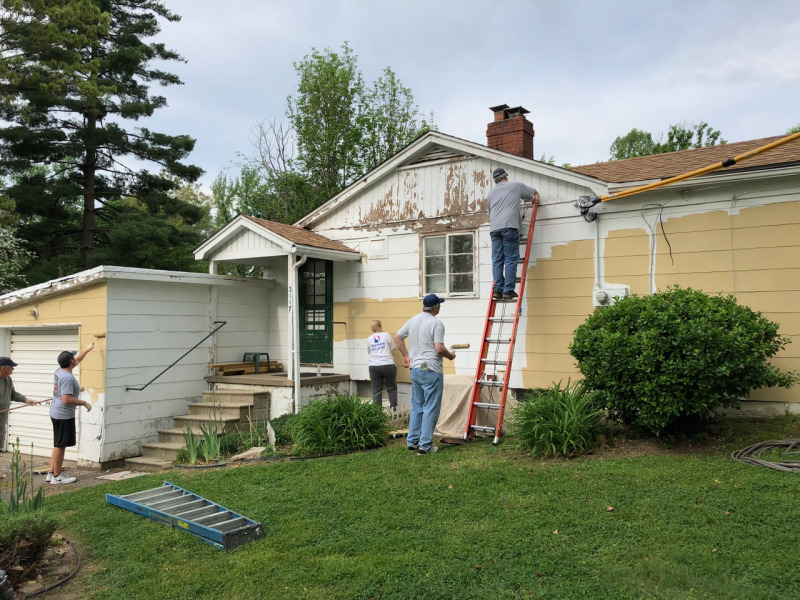 Alton/Godfrey Rotary has been an important part of this effort painting many homes themselves with individual members serving on the board and supervising the painting of other homes. 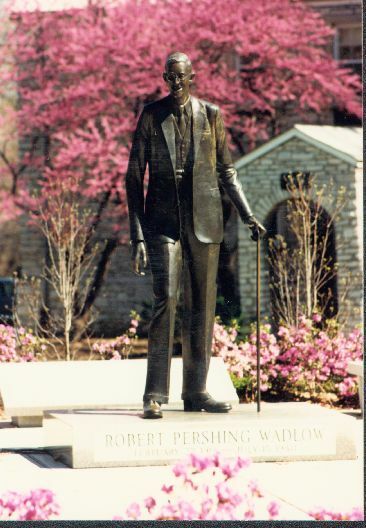 In 1985, two years after the dedication of the Piasa Bird sculpture mounted on the Mississippi River bluffs, Alton/Godfrey Rotary led a fund drive to raise $110,000 and commissioned local artist Ned Giberson to sculpt and cast the life-sized statue of Robert Wadlow, Alton's beloved Gentleman Giant, that stands on the Upper Alton campus of the Southern Illinois University School of Dental Medicine. The Robert Wadlow chair was dedicated in October, 2002. It is a life sized bronze replica of Robert Wadlow's chair. The original chair was given to Franklin Masonic Temple in Upper Alton. Because of the age and condition of the chair, no one is allowed to sit in the chair. 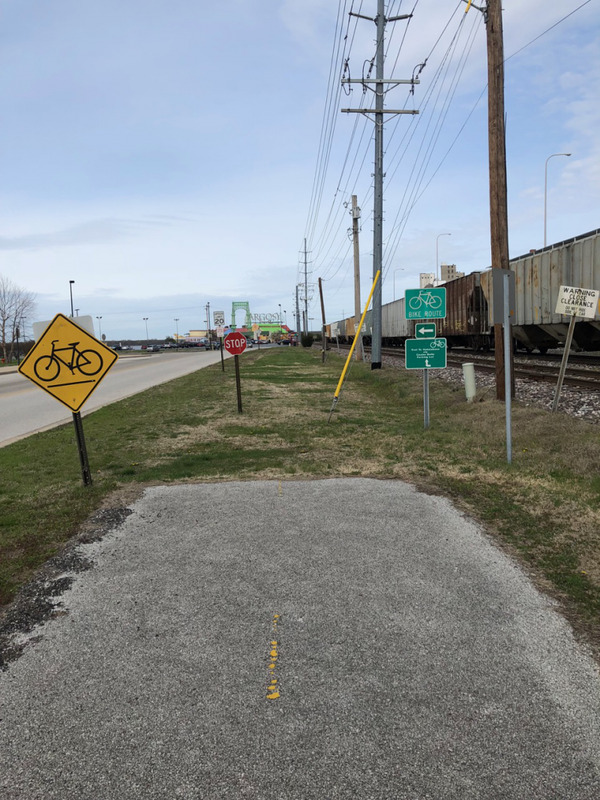 This project was chaired by Scott Neudecker as the President of Upper Alton Association, Inc. Alton/Godfrey Rotary contributed $7,500 to the project. 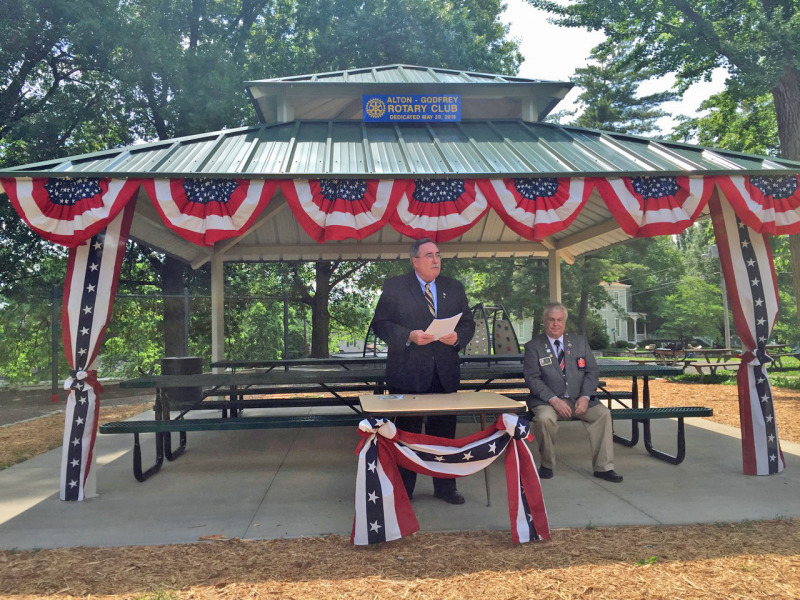 Bill Moyer coordinated the installation and site construction with the help of many Rotary volunteers. The chair was installed and the brick and blocks were laid. The final cost of the chair was $75,000. The Alton/Godfrey Rotary CLub initiated the Student of the Month program in 1997 which honors outstanding students from Alton, Marquette Catholic, and Mississippi Valley Christian High Schools. Students selected must be seniors and are selected on the basis of outstanding scholarship, participation in school activities, and involvement in community service projects and activities.. Through the current year, 144 students will have been honored. As part of the program, one student is selected each year as Student of the Year which includes a $2,500 scholarship award to be used by the students at the college of their choice. Three of the seven students selected for this honor have received a Bachelors Degree and are pursuing additional graduate work or advanced professional study. 2004-Joe Holleran, Freshman, University of Illinois. 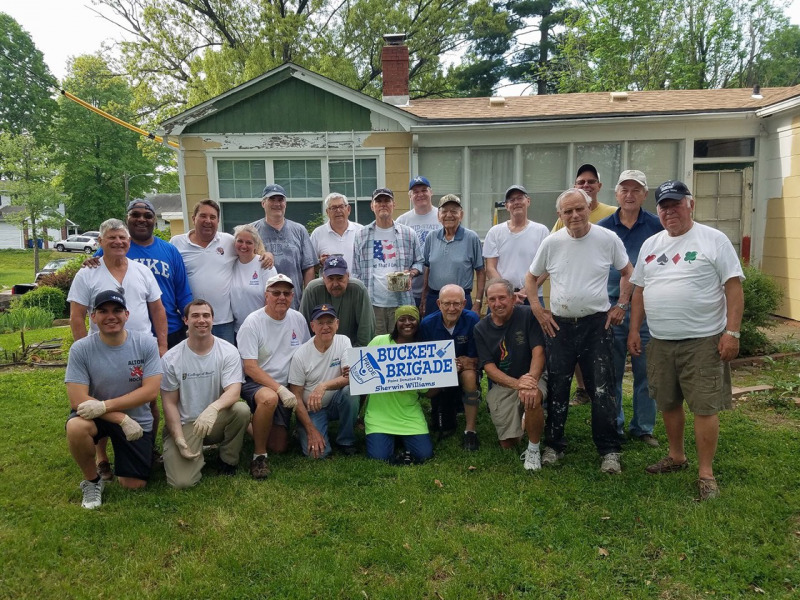 Members of the Rotary Club of Alton/Godfrey were inspired to build a home for Habitat for Humanity after attending the Rotary International Convention in 1998 in Indianapolis. 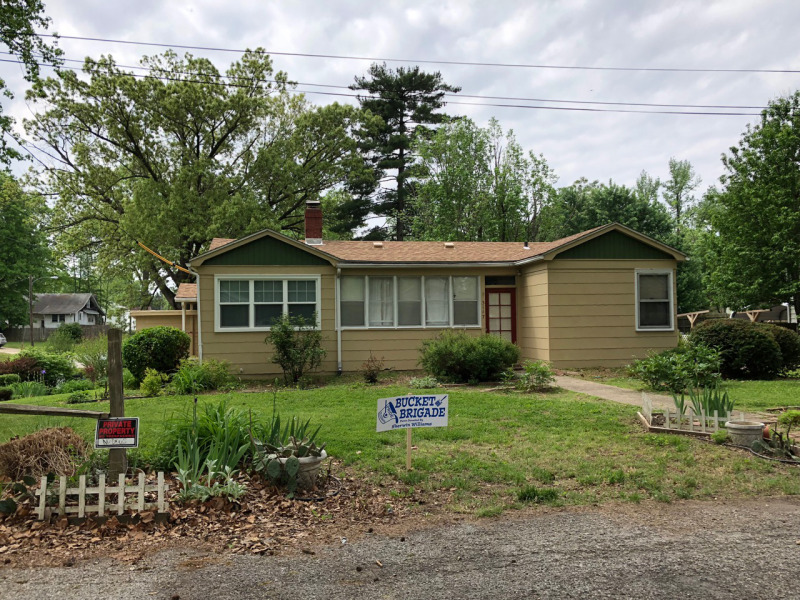 Bill Moyer, who owns Moyer Contracting Co., Alton, and Jim White, of White's Nursery in Godfrey served as co-chairmen of the home building project. 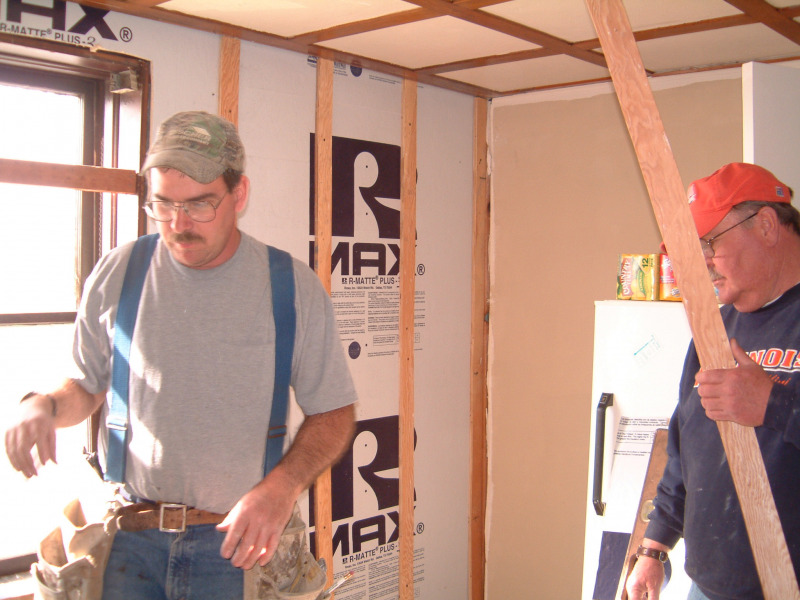 Local businesses teamed up with the Rotary Club to donate material to construct the home for a young family. Rotary provided $10,000 of the $58,000 cost. The home was completed in the fall of 2002. 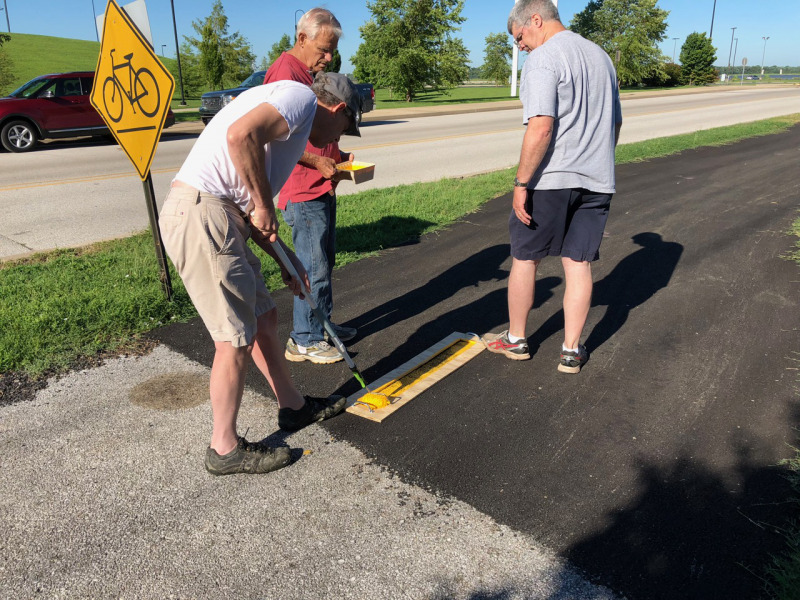 The Alton-Godfrey Rotary Club helped the Y directors realize an important goal of constructing a playground for participants in the Child Care Program. In 2002, Rotary members assembled equipment and materials for the project, and provided hundreds of volunteer hours to construct the playground that has a total value of $32,000. In 2002, Rotary was asked to assist with a project called the "Oblate Ecological Initiative". 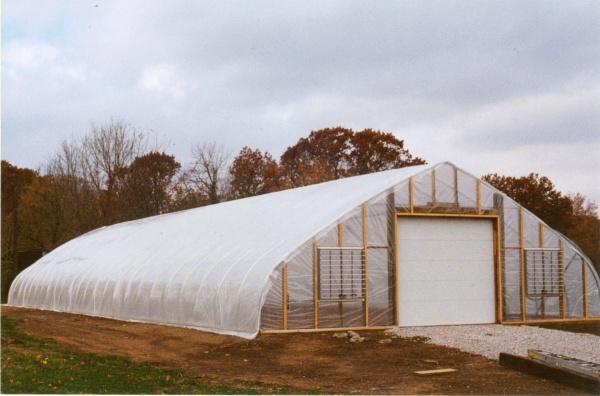 Rotary provided $10,000 for materials and many hours of labor to construct a greenhouse for the project. In 1985, Rotary launched the Polio Plus program to protect children worldwide from the cruel and fatal consequences of polio. In 1988, the World Health Assembly challenged the world to eradicate polio. Since that time, Rotary's efforts and those of partner agencies, including the World Health Organization, the United Nations Children's Fund, the United States Centers for Disease Control and Prevention, and governments around the world, have achieved a 99 percent reduction in the number of polio cases worldwide. In 2003, the Alton/Godfrey Rotary Club donated $17,000 additional funds to the Polio Plus campaign. Written and compiled by Ron Mayhew and Larry Thompson for the 100th anniversary of Rotary on February 23, 2005. It's fitting that we take a few minutes this evening to reflect on the 90th anniversary of the founding of the of the Alton-Godfrey Rotary Club. This community, our country, and yes, the world, were much different places nine decades ago. I'm certain there is a lot of knowledge about the history of this club among those who are gathered here this evening. But I'm also certain that what we think we know about the accomplishments of this club over the past 90 years pales in comparison to the actual impact this club and its members have had here locally and even around the world. Bill Reavis was the superintendent of schools in 1921. He convinced 25 leaders of industry, the professions, and business to agree to meet weekly, the use each other's first names, to share the vagaries of one another's professions, to raise their voices in song, to stand in front of their contemporaries and make speeches, and to unite in the principle that the occupation of the lowly shoemaker was equal in dignity to that of the banker from whom he borrowed money to buy leather so long as each rendered honorable service to his customer. Is it possible that Bill Reavis and the other 25 could have comprehended what would follow? Could they have known the connection they would make with those of us in this room tonight? Because we are connected to them, we are connected to projects, and acts of service, and people of all stripes who have served as we strive to serve. Bill Reavis and the other 25 passed their vision and dedication on to a succeeding generation, and they to another, and on and on. The times have changed, the cast of characters has changed, the community has changed, the world has changed, but the desire to serve has not. Imagine Alton in 1921-No bridge, no lock and dam-A bustling river town booming with industry. The doughboys home from the war, the future bright, and Bill Reavis and the other 25 taking the first tentative steps on a great adventure. 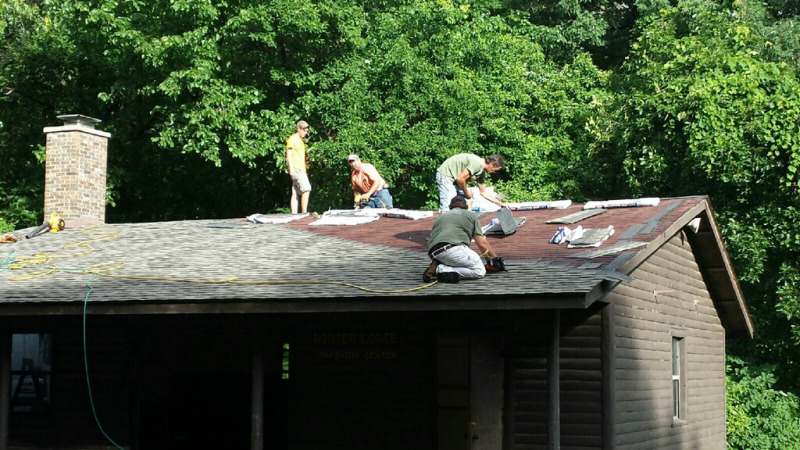 Early on, the Alton Rotary club took on a grandiose project. 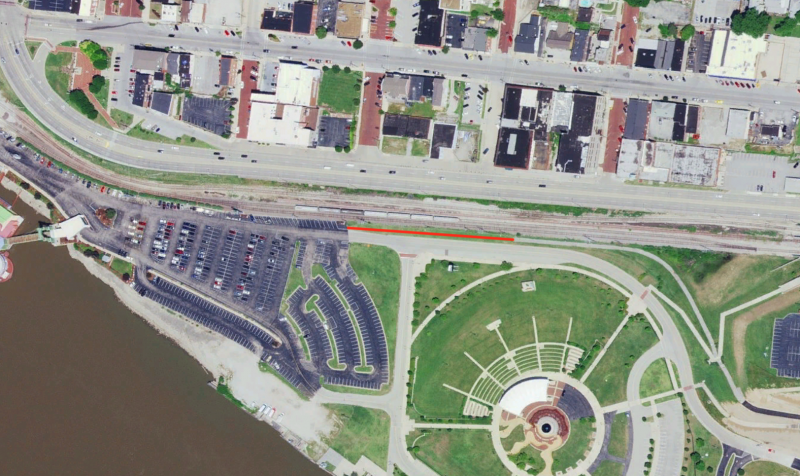 Somebody had the idea that the riverfront, replete with shanties, unsightly fish markets, and rambling boat docks could be improved in appearance by dredging sand over the clay banks. A contract was let. Work was completed, and when it became apparent there was no one to pay the bill, club members were assessed $25 each. As Tom Butler says in his club history: the club was cured of taking on great undertakings for many a year. I had planned to spend just one minute recounting the accomplishments of each of the first 90 years. But Roland (Roland Hansen) told me I had 10 minutes. Well, that's just over one minute for each decade. I can't even list the major projects in that amount of time. 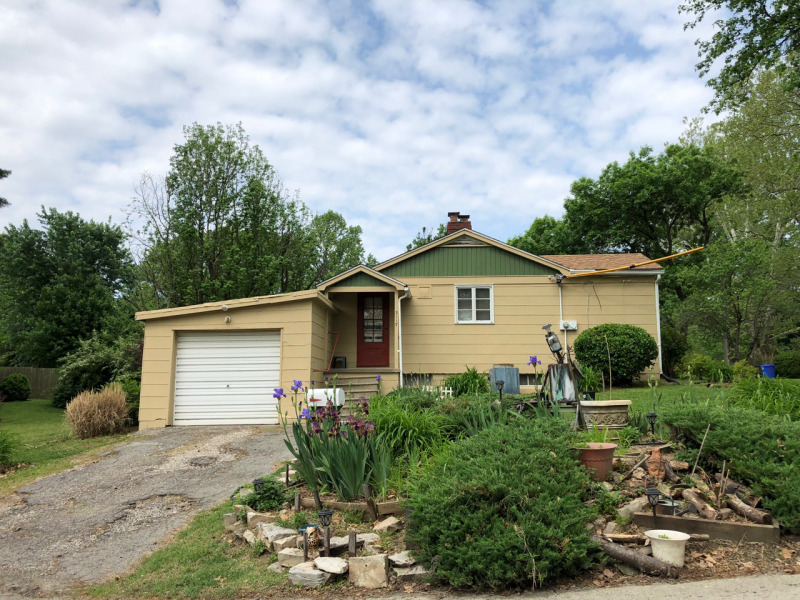 We're familiar with the more recent: statues of Lincoln and Douglas, Wadlow and his chair, the Piasa Bird – which lives on at southwestern high school, a habitat house, a greenhouse at the community supported garden, fountains here, there, and everywhere. 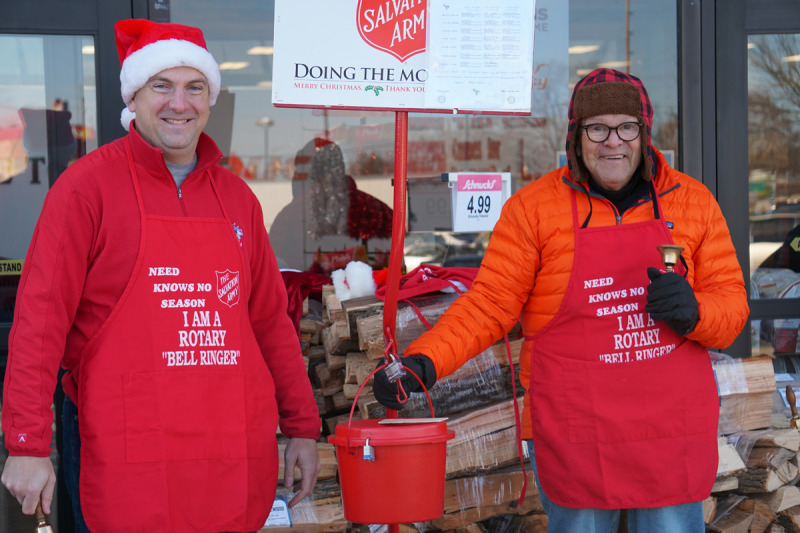 Bucket brigade, Salvation Army bell-ring, police vests, students of the month and the associated scholarships, the Community Christmas tree, and most recently, the beautiful steamboat mural. But there were community-changing projects in the early years, too. Projects like Public School Stadium, the Clark bridge – not the beautiful bridge we have now, but the utilitarian, community changing structure that served well, but outlived its usefulness, the MacAdams highway – now known as the River Road, the Beltline highway, a survey of historic buildings, football tribute dinners, exchange students, and countless other projects that simply weren't recorded on paper and escape our notice, but contributed greatly to the legacy of this club. And how do we measure the connections of one member to another? The friendships formed? The understanding gained? The knowledge transferred? Wounds healed? Grieving consoled? How do we measure the impact of the work we do? How many lives have been changed? You ring a bell, and a life is changed. We give a scholarship, and a life is changed. We host an exchange student and a life is changed. Members of this club have contributed $50,000 over the years to polio plus. How many lives have been changed? We have made our community better. We have made the world smaller. I remember hosting a group study exchange team from Brazil just over ten years ago. We started with lunch at Fast Eddie's Bon Air. We spent an afternoon on Pete Zimmer's boat. We heard their presentation at one of our meetings. We learned about their culture, they ours, and they were gone – maybe even forgotten. But they remembered us. So much so that they were compelled to write our club. You see, they, in a different hemisphere, on a different continent, in a different culture, were concerned for us when, on a beautiful fall morning in September of 2001, our way of life and our culture was attacked. Those Brazilian women reached out to us, grieved along with us, sought to console us. We were connected to them, and they to us. Just as we are connected to Bill Reavis and the other 25. You see, it matters not where we meet, when we meet, who we choose as a leader. What matters is the connections we have made. The connections we don't even know we've made. What matters is the lives changed. And what matters most is that the life changed most just may be our own. And that is the manifestation of the Rotary motto of --- He Profits Most Who Serves Best. So let us raise our glasses to Bill Reavis and the other 25, to the hundreds of other Alton-Godfrey Rotarians who have followed, to the connections made, to the lives changed. And let us raise our glasses to those who have changed our lives. Here's to nine decades of Service Above Self. And here's to those who will carry on the tradition with which we are briefly entrusted. Here! Here!